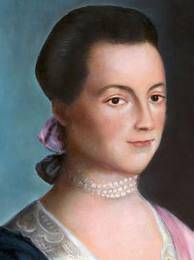 Abigail Adams (1744-1818) was the wife of John Adams and a prolific correspondent who often touched on social and political issues. Born Abigail Smith to an affluent Massachusetts family, Adams received no formal education but was homeschooled and became an obsessive reader. She married her cousin John Adams, then a struggling country lawyer, in 1764; it was a marriage of love and affection rather than arrangement and convenience. 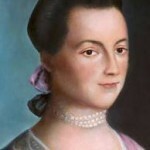 She played no direct role in the course of the American Revolution, however, Adams corresponded regularly with her husband, as well as Mercy Otis Warren and Thomas Jefferson. Adams’ extant letters reveal her views about the revolution, its key figures and, tellingly, the role of women in revolutionary and post-revolutionary America. Her plea to her husband to “remember the ladies” is one of the best-known remarks about the rights of women in the new republic. Adams later served as ‘first lady’ when her husband became the second president of the United States.